Ricky Ian Gordon was born on May 15, 1956 in Oceanside, NY and raised on Long Island. After studying composition at Carnegie Mellon University, he settled in New York City, where he quickly emerged as a leading writer of vocal music that spans art song, opera, and musical theater. Mr. Gordon’s songs have been performed and or recorded by such internationally renowned singers as Renee Fleming, Dawn Upshaw, Audra MacDonald, Kristin Chenoweth, the late Lorraine Hunt Lieberson, Frederica Von Stade, Andrea Marcovicci, Harolyn Blackwell, and Betty Buckley, among many others. 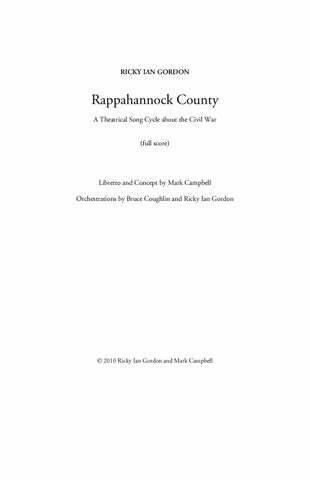 Recent productions include Rappahannock County (libretto by Mark Campbell), a fictional song cycle inspired by diaries, letters, and personal accounts from the 1860s. 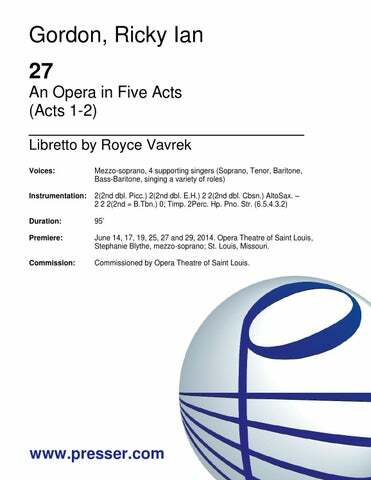 Premiered at the Harrison Opera House in April, 2011, the work was co-commissioned in commemoration of the 150th anniversary of the start of the American Civil War, and a recording on Naxos is set to be released this fall. 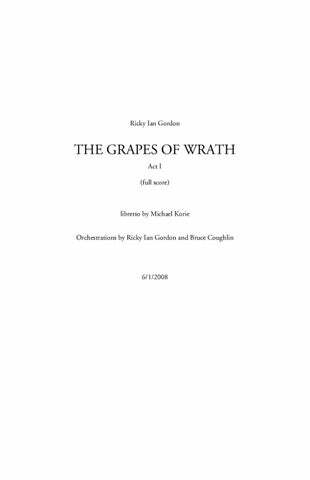 A two act concert version of The Grapes of Wrath, with a libretto by Michael Korie, was performed at Carnegie Hall in March, 2010, narrated by Jane Fonda. 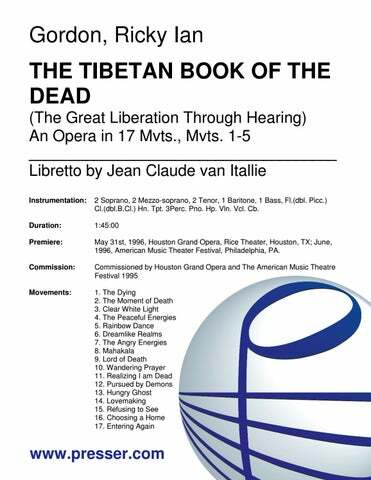 Green Sneakers, a theatrical song cycle for Baritone, String Quartet, and Empty Chair, with a libretto by the composer, premiered in July, 2008, in Vail, Colorado, at the Alberto Vilar Performing Arts Center, when Gordon was Composer-in-Residence at the Bravo! Vail Valley Music Festival. The work has also been recorded on Blue Griffin Recording. The Grapes of Wrath (2007), a full-scale opera in three acts with a libretto by Michael Korie, premiered at the Minnesota Opera in a production that then traveled to Utah Opera and Pittsburgh Opera. 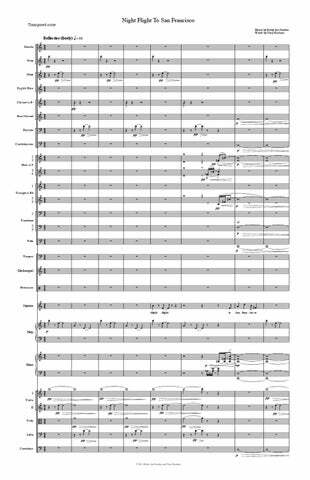 Musical America called the work, “The Great American Opera,” and Opera News Magazine described it as one of the “Masterpieces of the 21st Century.” A suite from the opera was premiered at Disney Hall in spring, 2008. 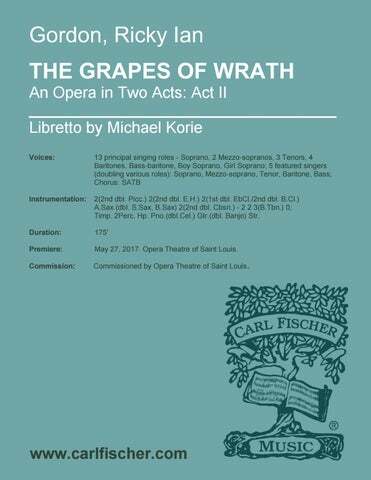 The full opera, live from the Minnesota premiere, is now available on a 3 CD set with libretto liner notes on PS Classics. Carl Fischer has published the Vocal Score as well as a folio of arias from the opera. Orpheus and Euridice, an hour-long song cycle in two acts, premiered at Lincoln Center in 2005. 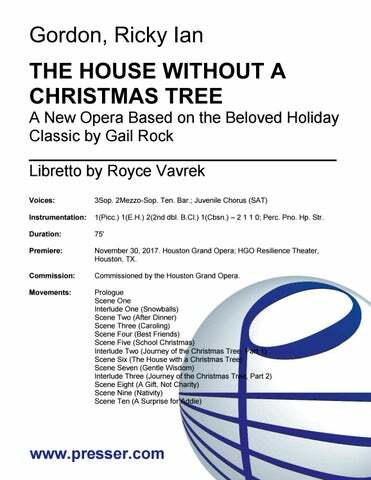 Directed and choreographed by Doug Varone and performed by Elizabeth Futral, Soprano, Todd Palmer, Clarinet and Melvin Chen, Piano, it won an OBIE Award and is recorded on Ghostlight Records and published by Carl Fischer Music. 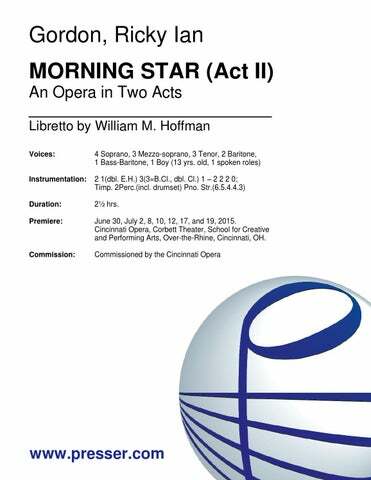 The work was given new productions at Long Beach Opera in February, 2008, and Fort Worth Opera in July, 2008. Mr. Gordon is currently working on commissions for New York’s Metropolitan Opera with Playwright Lynn Nottage, and a new opera for the 50th anniversary of the Minnesota Opera (based on the novel, The Garden of the Finzi Continis) with librettist Michael Korie. As a teacher, Mr. Gordon has taught both master classes and composition classes in colleges and universities throughout the country including Yale, NYU, Northwestern, Juilliard, Manhattan School of Music, Catholic, Bennington, Vassar, Carnegie-Mellon, Elon, Michigan State, University of Michigan, Point Park (McGinnis Distinguished Lecturer) and San Francisco Conservatory. He has been the featured Composer-in Residence at various festivals, including the Hawaii Performing Arts Festival, Songfest at Pepperdine University, Chatauqua, Aspen Music Festival, and Ravinia. Among his honors are the 2003 Alumni Merit Award for exceptional achievement and leadership from Carnegie-Mellon University, the Shen Family Foundation award, the Stephen Sondheim Award, The Gilman and Gonzalez-Falla Theater Foundation Award, The Constance Klinsky Award, and many awards from ASCAP, of which he is a member, The National Endowment of the Arts, and The American Music Center.